Dr Kim was kind, patient and explained everything in a way I could understand. He took his time, was proactive inoffering additional examination to make sure he was getting a full picture. Dr Kim was kind, patient and explained everything in a way I could understand. He took his time, was proactive in offering additional examination to make sure he was getting afull picture. Dr. Gene Kim is excellent. Here's why, Gene is kind and friendly, he takes his time and listens, and makes theright recommendendations on what to do. I am very happy for Gene to be my doctor. Also the office staff are very helpful and kind. Dr. Gene Kim is excellent. Here's why, Gene is kind and friendly, he takes his time and listens, and makes the right recommendendations on what to do. I am very happyfor Gene to be my doctor. Also the office staff are very helpful and kind. Dr. Kim is a native of Southern California and has lived in Los Angeles, Chicago and San Francisco. He was the resident of the year at St. Mary’s Medical Center in 2007 and served as the Chief Resident in 2007-2008. He has worked at the Sister Mary Phillipa Health Center for the undeserved from 2004-2009. He has been in practice with Dr. Savant since 2008. 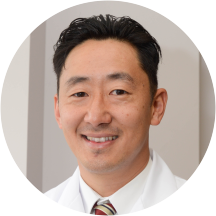 Dr. Kim enjoys medicine the most when he and patients can make educated decisions based on current guidelines and research to fit an individual patient’s needs and preferences. He also enjoys being part of the University of San Francisco Athletics medical team, baseball, basketball and golf. IMPORTANT NOTE: IF YOU HAVE A BLUE CROSS OR BLUE SHIELD OR A COMBINATION OF BOTH, PLEASE CHECK WITH YOUR INSURANCE CARRIER TO MAKE SURE DR. MARK SAVANT IS IN NETWORK WITH YOUR PLAN BEFORE SETTING UP AN APPOINTMENT. Dr Kim has the highest-level of professionalism. He listens with respect and consideration; he consults patient history to “connect the dots” and offer suggestions toward solutions. Very easy to have a conversation with Dr. Kim. I made a day-of appointment with Dr. Kim. I felt comfortable, listened to, and in no way rushed. Dr Kim took his time to check me. He answered all my questions. He is a very friendly and knowledgeable doctor. The front desk ladies were very helpful. I asked for a additional paperwork for my insurance. The doctor wrote thispaper promptly and Andrea from the front desk sent it to me per email really fast. Thanks for everything! The office at Savant Medical can be unresponsive and difficult to deal with for insurance issues. But Dr Kim is great! Super friendly, gentle, thorough and a primary care doctor I would like to see for the rest of my life. Trustworthy, friendly, incredibly diligent doctor that cares about his patients! He deserves 5,000 stars for the way he approaches patients and has the nicest demeanor to him. If you can get an appointment with him, highly recommend Dr Gene Kim for all your medical needs. Doctor Kim is great. The people at the front are extremely rude however. Such a chame! Dr. Kim was great! He spent a lot of time with me to understand my health history and provided tips for wellness. A truly great bedside manner. Dr. Kim is very easy to talk to and you actually feel like he is truly taking the time to listen to you. He asks all the right questions and is very comprehensive. I'm thankful for other people's positive reviews abouthim because they are all true and are the reason why I decided to choose him to visit. He was such a caring doctor - asked how I was doing and made sure he understood my medical history. Will make him my new PCP. Doctor was great but office was a bit hard to find and overall looked really old. Front staff could’ve been more professional. Loved Dr Gene, he was super friendly and attentive. Dr. Kim is a true professional, very knowledgeable, and makes solid recommendations. I recommend him highly. Extremely pleasant and kind. Professional and clean environment. Good bedside manner. Clearly explained the further workup I need to my daughter. Really great doctor! Extremely friendly and thoughtful. Makes you feel heard and even though I know his job is hard to figure out exactly what is wrong with me he gives multiple suggestions that feel actionable on my part. Would recommend ! Gene was very friendly and helped setup the appointments I needed. Quickly built trust. Dr.Gene Kim cares patients empathetically and his bedside manner is truly amazing. He spent extra time and check if patients have any other issues. Dr. Kim was attentive, and he seemed interested in understanding my medical history and learning more about my health goals. He also provided options for further investigation into some of my concerns – most of the other doctors I've seen tend to shrug these off. The dr. Had a very nice manner very friendly and made you feel comfortable. Dr. Kim is always very nice and helpful. Very very helpful and excellent bedside manner. I feel very comfortable with this doctor. Doctor Kim and his staff were great. Even though I was in and out of there quickly somehow it felt thorough and personal. Highly recommend. Very knowledgeable, stayed late to help me and listen to my concerns, always leave my appointments feeling better! Dr. Gene is always cheery and upbeat but also serious when he needs to be. He puts me at ease and always goes a good job of listening and setting a course of action together. Prompt and courteous! Dr. Kim is great to work with, and his office staff are super kind. Very good experience with Dr. Kim. Friendly, personable, professional, on point. Dr. Kim was very personable and thorough. I left with high confidence in his practice. I wouldn't hesitate to return for my next ailment. Dr. Kim is a great doctor and primary care physician! He cares about his patients and is extremely personable! Whenever I have to make a visit, I know he has my best care in mind! If you're looking for a greatdoctor and someone who is great at what they do, see Dr. Kim! Dr. Kim is my dude. Friendly, sincere, talks me through stuff, answers my questions. Real and conversational. I've been seeing Dr. Gene Kim as my primary care doctor for about 4 years now and highly recommend him and Savant Wellness. I have seen both Dr. Kim and Dr. Savant and they are both genial, patient and kind doctorswith great bedside manner. Dr. Kim is a great listener and follows up with me in a timely manner and remembers year to year and appointment to appointment what is going on with me. He makes thoughtful recommendations but isn't pushy and always asks if I have any questions or concerns. His office staff are very helpful and accommodating (HUGE BONUS) and have helped me get doctor's letters through for insurance a few times. I'm always seen in a timely manner and I never feel rushed at the office. Dr. Kim is the absolute best. Had a wonderful appointment. Paperwork was easy. The receptionist was very nice and helpful. Dr Kim was very informative about taking next steps. I? highly recommend seeing him. Very kind and quick service. Answered all my questions. Great personality and very thoughtful. Very pleasant to interact with. Dr. Kim was very friendly, and I felt well taken care of. Patient and very mellow. I haven't been in a doctors office in years so naturally I wasn't looking forward to it but he made it pleasant. Dr. Kim is always excellent! I have recommended colleagues of mine to him and will continue to see him anytime I am in San Francisco working. He is a great doctor, and also has superb patient communication skills (he listens to you!). I highly recommend him to anyone. Dr Kim was awesome, you can tell he's a competent doctor. I came in with a bunch of questions and concerns and I left feeling taken care of. He was very nice and made me feel comfortable. The wait time (45 minutes) was the only downside.